Lexi Middleton has been socially invisible to her classmates, but starting her junior year, that’s going to change. First, she’s determined to hook a boyfriend, ensuring dates with flowers and possible kisses on the doorstep. Second, she wants to be a writer for the school paper, even though it freaks her out to think of everyone judging her by her punctuation and metaphors. High school is difficult enough—keeping up her grades, dealing with increasing sibling rivalry, and trying to stay out of the way of her personal nemesis, Amberlee—but when Lexi catches the eye of her long-time crush, she also becomes the focus of mean-girl tactics. Caught between who she was and who she wants to be, Lexi must decide how to confront a bully, and choose who to let into her heart. This was the second book I read by the mother/daughter writing team that is Jo Noelle, the first, Newbie I enjoyed immensely. 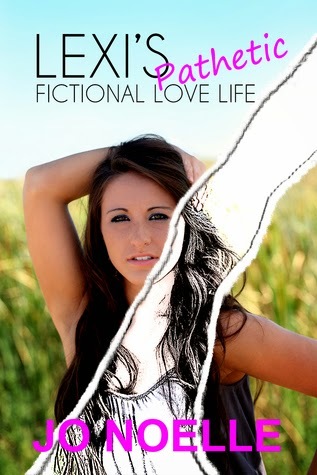 Lexi's Pathetic Fictional Life was just as enjoyable but in a different way. My favourite thing about it is the story within the story and how Lexi grows as a writer as her character grows as a person. It's pretty fantastic story-telling. I also enjoyed how realistic Lexi's relationship with her sister is, it reminded me of my own relationship with my sister. It was a great was a great read all around.